This individual Report Off-Premise ATM Deployment: Fighting for Merchant Floor Space in the Age of Cash Back is available for purchase. This Report is available to members of Mercator Advisory Group’s Debit Advisory Service. Please be advised that this Report is normally part of a research and advisory service that provides ongoing support throughout the year. As such, this Report contains significant depth of content that is selected for its strategic importance to our members. (For a description of these services, see our Advisory Services section). 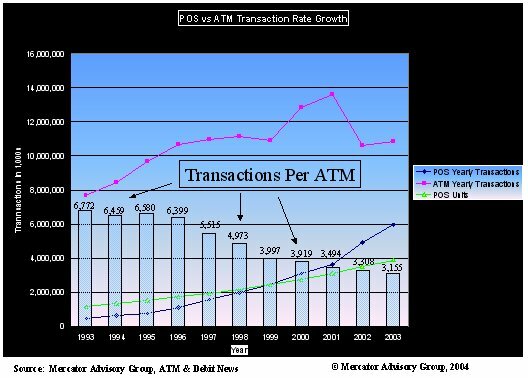 Off-premise ATM Deployment: Fighting for Merchant Floor Space in the Age of Cash Back provides the reader facts that demonstrate how ISO organizations have broken the unwritten law that states ATMs cannot be profitable below 300 transactions a month. Additional facts in the research report show that the ATM market is not saturated from too many ATMs, but is instead suffering from a major shift in consumer behavior, away from the ATM and towards cash back at the point-of-sale. This trend reduces the consumer need for ATMs and effectively shrinks the ATM market. Tim Sloane, Director of the Debit Advisory Service, states that "Financial Institutions are deploying off-premise ATMs that incorporate new services that include ticket printing, couplons, and mobile phone top-ups, that generate additional ATM revenue but fail to address the merchant's larger need for increased foot traffic and repeat business. If ATM suppliers allow the point-of-sale device to become the exclusive channel for loyalty programs then the ATM market will continue to shrink." To counter this trend towards cash back at the point-of-sale, ATM deployers must provide more loyalty and self-service solutions to merchants, and this report identifies several such solutions. While the research data cannot provide "the answer", the report argues that a focus on innovative merchant solutions, not just cash back, will be pivotal going forward. But self-service and loyalty programs require modifications in: the network, ATM, ATM driving, transaction processing, applications, business contracts and business relationships, so implementation of these programs will evolve over years, and likely on a regional and vertical basis. The report is 24 pages long and contains 14 exhibits.